For this exercise you will need a pair of casino dice. Used casino dice are available at most casino gift shops. 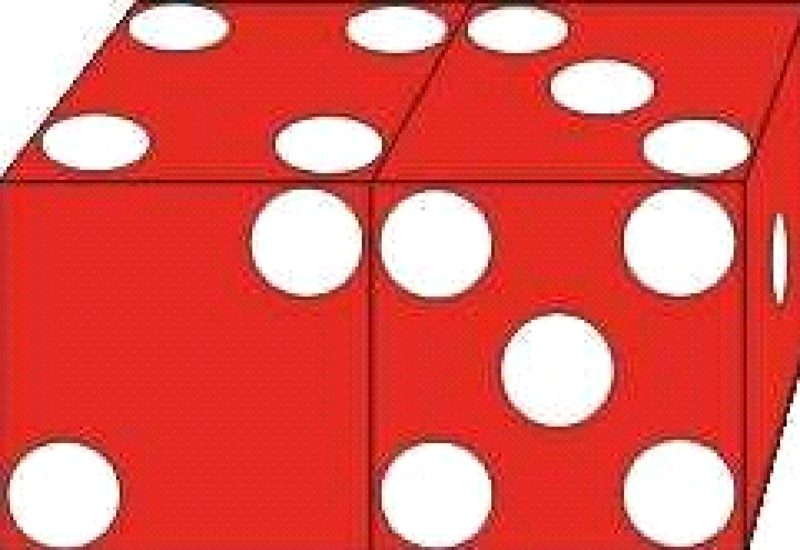 You can also order new casino-quality dice on-line from a number of sources, including www.axispowercraps.com. Purchase several sticks (a set of five matching dice) in different colors to use when practicing your precision shooting. Orient the dice in front of you as shown in graphic 2.1. This is one of the most powerful pre-sets for the come out roll. It is called the All Sevens Set because the seven shows on all faces of the dice. It is also known as the 1-6/1-6 Axial set. This designation is derived from the numbers that appear on the left and right side or lateral faces of the dice. Another name for this set is the 4-2/3-5 set because the left die has the 4 up and the 2 facing the shooter and the right die has the 3 up and the 5 facing the shooter. Confusing? Just pick a term you can remember easily and go for it. The “All Sevens Set” will do fine. Imagine you have your dice in this pre-set and there is a steel rod or axle running them as shown in Graphic 2.1. The axle runs through the center of the one-spots and prevents the dice from tumbling any way but forward and backward. If you could toss dice like this in the casino, what would be the results? 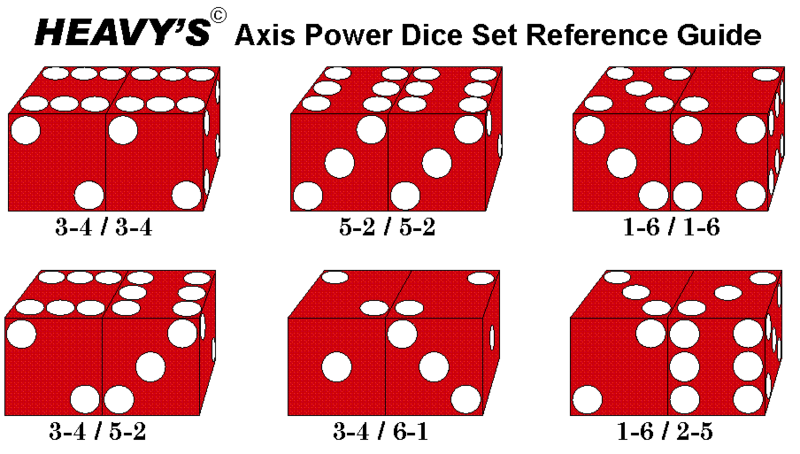 With the axial model of dice control the number of possible combinations of the dice is reduced from thirty-six to sixteen. With 100% axis control there are only four faces that can come up on each die when rolled on axis. Additionally, under this model you would never hear the stick person call two, three, or twelve craps. Why? Because there are no ones or sixes showing when the dice are rolled on the All Sevens pre-set. The one and six are taken out of the equation, and without them you can’t roll a Craps. Now take a moment to count the number of combinations of the dice that add up to seven when using this set. If you come up with four, you are absolutely correct. When rolled on axis the All Sevens Pre-Set yields a natural winner 25% of the time – with NO craps losers. That’s a powerful first step toward playing craps with a positive expectation. Compare that to the random roll in which eight of the thirty-six combinations of the dice are naturals that add up to seven or eleven. Naturals will appear only 22% of the time. Net out the four combinations that result in come-out losers – the two, three, and twelve craps – and the percentage drops to 14%. So pre-setting to the All-Sevens and rolling on axis can equate to about an 11% advantage over a random Come-Out roll. And that goes a long way toward making craps a positive expectation game. This is one of the most powerful pre-sets for use after the come out roll. Like the All Sevens pre-set, when rolled on axis there are only sixteen possible combinations of the dice instead of the random thirty-six. But unlike the All Sevens set, only two of these combinations add up to seven – the 3-4 and the 4-3. In other words, when rolled on axis the seven will only appear 12.5% of the time. Compare that to the random roller, who sees the seven on 16.7% of his rolls, and the potential power of this arrangement becomes abundantly clear. Look at the number of combinations that add up to six and eight. There are three ways to make each of these numbers, compared to two combinations that add up to seven. So the axis adjusted odds are 3-2 in favor of the six and eight, and the five and nine are even money. But since the five and nine place bets are paid off at 7-5, these wagers carry a positive expectation as well. Like the All Sevens pre-set, the V-3 Hard Six has many permutations. While most players prefer to arrange the dice with the hard six on the top faces, some prefer to have the eleven facing up and the hard six and hard eight facing up and down table. Others will rotate one 180° on axis – presenting the eleven on the top faces, but arranging the dice so the 3-4 and 4-3 face up and down table. This variation is popular with many precision shooters on the come out roll. While these variations can be powerful and effective tools for the experienced precision shooter, initially we recommend that the beginner stick with the specific arrangements pictured in this book. The pre-sets shown on the top row are all seven-rich arrangements. They are the Straight Sixes, the Parallel Sixes, and the All-Sevens sets. When rolled on axis, each of these arrangements contains four combinations of numbers that add up to seven. For that reason they are often used when the shooter wants to toss sevens. Conversely, the pre-sets shown on the bottom row are point rich sets. There are only two combinations of numbers that add up to seven when these arrangements are rolled on axis, making these arrangements popular with controlled shooters once the point is established. When tossed on-axis each set has its own particular strengths and weaknesses. Since we have already covered the All Sevens and the V-3 pre-set arrangements, let’s take a look at the number distribution tables for the other four basic dice sets. First on the list is the Straight Sixes – or the 34/34 Axial pre-set. At first glance this looks like an excellent pre-set for the come out roll. There are four ways to win with the seven and two ways to win with the eleven. But further scrutiny reveals four ways to lose on the come out as well – the 2, 3, and 12. There is also a possibility of establishing the four or ten as the point – both difficult numbers to hit with any pre-set. So who would use this set? While we don’t recommend the wager, this dice set arrangement is quite popular among players who bet the Horn or World prop bets on the come out roll. A skilled precision shooter might bet $25 on the pass line along with a $25 World bet. If he throws the seven he wins $25 and the World bet is a push, or tie. If he throws the eleven he wins $25 for his pass line bet and an additional $75 for the World Bet. The three-craps also pays $75, though the shooter would lose his $25 pass line bet. Should the shooter be skilled enough to toss a two or twelve his World bet will pay $150, less the losing $25 pass line bet. Since the housed advantage on the proposition bets is so high, this is not a strategy a true advantage player would use. On the other hand, it can provide an element of fun for casual dice setters who play primarily for the entertainment value of the game. Another wager you might see used in combination with this dice set arrangement is a Lay bet against the five and/or nine. Look at the chart once again. When tossed on-axis there are no fives or nines on this set. A $31 No Five bet would kick off a net $19 win if the shooter managed to toss a seven on the come out. Looking at the numbers, it is plain that this pre-set leaves a lot to be desired. Yes, there are four ways to win with the seven, but there are also two losers – the two and twelve. Since there are four combinations that add up to seven, the smart precision shooter would not use this set once the point is established. Or would he? You’ve probably heard the old story about how children are conditioned to “follow the rules” and “color inside the lines” when they are young – and how that can stifle creativity. To understand how to use this preset, you have to get outside the lines for a moment. Remember that “No Five” bet we talked about a minute ago? Well, you could take it one step farther. Not all precision shooters shoot from the pass line. Some prefer to play the don’t pass. Should such a player end up with a don’t pass bet on a point of six or eight he might well switch to the Parallel Sixes pre-set. Why? There is only one combination of numbers that adds up to six or eight with this pre-set arrangement. Now go a step further and look at the number distribution in relation to the other bets on the layout. See anything of interest? The Field Bet – a wager most smart players have learned to avoid – can be a winner with this pre-set. The Field is a winner on the 2, 3, 4, 9, 10, 11, and 12. There are eight combinations of the dice that add up to those points in the Parallel Sixes pre-set – compared with eight combinations that lose in the field. Even odds, right? But since the payoff is doubled on the 2 and 12 – and tripled on one or the other of those numbers in some casinos, that brings the total number of single unit wins to 10 or 11, depending on the layout – versus eight one-unit losers. To take it to another level, a precision shooter who never learned to color inside the lines might go so far as to play the Don’t Pass line while utilizing this pre-set and bet the Field at the same time. It’s not a play we would recommend, but it works for some players. We’ve already looked at the All Sevens set and its variant, the Hardway set, at the beginning of this chapter. Again, this is the most powerful pre-set for the come out roll and should be given strong consideration. The odds are good that the six or eight will be established as the point with this pre-set. A common strategy is to combine pass line play with all the hardways working on the come out. For example, by betting $10 on the pass line plus $2 each on all of the hardways – the player will still be guaranteed a small win if the seven is rolled. But if one of the hardways turns up, he picks up a quick fourteen to eighteen bonus dollars. Again, remember that proposition bets carry a huge housed edge you have to overcome with your toss. Most players will do well to avoid them. Now let’s look at the point-dominant pre-sets. These are the sets skilled players generally gravitate toward after a point is established. They are the Crossed Sixes, the Mini-V Hard Four, and the V-3 Hard Six arrangements. First on the list is the Crossed Sixes – or the 3-4 / 5-2 Axial pre-set. Remember, some dice setters refer to this as the 6-2/6-3 set, reading the dice from left to right. This set is extremely popular with precision rollers who enjoy playing all the numbers. A look at the distribution chart reveals why. When the dice are tossed on-axis using the Crossed Sixes pre-set the shooter has an axis adjusted odds advantage over the casino on all of the inside numbers. Ordinarily place betting the five and nine, which carries a 4% house edge, is not recommended. But placing the five and nine can be profitable with this arrangement. 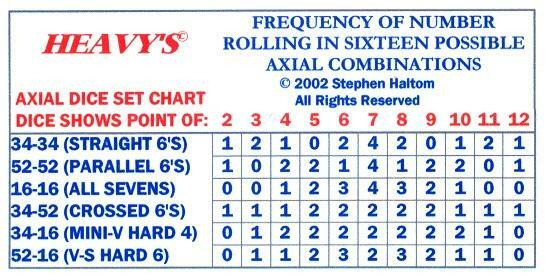 The frequent occurrence of Horn numbers on this axis prompts many recreational precision shooters to play the World or Horn bets on the come out roll with this pre-set. Others prefer to play the High-Low bet – the two and the twelve – on every roll. Can you profit from it? It depends on your skill level. On average, one of these numbers will show for every eight rolls of the dice. The winning wager pays 30-1. The only Place Bet numbers that do not carry an on-axis advantage for the skilled shooter utilizing the Crossed Sixes pre-set are the 3, 4, 10, and 11. But on particularly long rolls these numbers will often appear in streaks. For that reason, many precision shooters play an up-and-out strategy. They press their inside bets to a pre-determined level, then add the four and the ten out of subsequent payoffs. By switching from the Crossed Sixes to the Mini-V the savvy precision shooter gives up the two and twelve in exchange for an advantage on the four and ten. In fact, the axis adjusted odds favor the precision shooter on all of the point numbers. For that reason, precision shooters often place all the inside numbers and buy the four and ten when using this pre-set. When playing in casinos that collect the commission after the win on Buy bets this is the most powerful pre-set arrangement you can use. We’ve already looked at the V-3 Hard Six pre-set. In most instances is the preferred pre-set arrangement for experienced shooters. The precision shooter has an advantage over the casino on all the inside numbers. The fact that the six and eight are low vig bets to begin with means there is very little house edge to overcome – even with an off-axis roll. And, for recreational precision shooters this pre-set also offers ample opportunities to play the hard six and eight – often profitably. Let’s take one more look at all of the pre-sets and the numbers distribution. These six dice arrangements are the cornerstone of precision shooting. Eventually you will commit the various sets and their application to memory. If you need help remembering, feel free to print a copy of Table 2.7 for your personal use. Each of the basic axial pre-sets has its own particular strengths and weaknesses. Master them all, then explore the various permutations each presents. The rewards for intelligent play will follow. Copyright © by Axis Power Publishing – All Rights Reserved.